CLEVELAND, April 18, 2018 /PRNewswire/ -- Forest City Realty Trust, Inc. (NYSE: FCEA) today announced that the company has received the Urban Land Institute (ULI) New York's Award for Excellence in Office Development for the Tata Innovation Center at Cornell Tech, located on Roosevelt Island in New York City. ULI's Awards for Excellence recognize outstanding development projects in the private, public, and nonprofit sectors that best exemplify commitments to responsible land use and creating sustainable, thriving communities. "We are honored to receive ULI New York's prestigious Award for Excellence for the Tata Innovation Center," said Bob Sanna, Forest City New York executive vice president and head of construction. "At Forest City, we take on groundbreaking projects and use best-in-class sustainability and design practices to deliver unique, impactful buildings. At the Tata Innovation Center, we are bringing academia and industry together like never before, driving economic growth for New York, and serving a key role in one of the most sustainable campuses in the world." 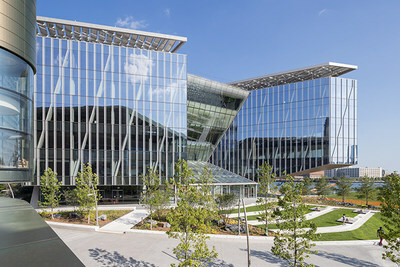 Formerly known as The Bridge, the Tata Innovation Center opened in September 2017 as part of the first phase of the Cornell Tech campus on Roosevelt Island in New York City. Designed by WEISS/MANFREDI, it is a first-of-its-kind building where an extraordinary mix of cutting-edge companies from diverse industries have the opportunity to work alongside groundbreaking Cornell academic teams: from recent Cornell Tech graduates commercializing new ideas, to start-ups targeting rapid growth and established companies developing leading-edge technologies and products. The building features gathering areas on each level, including a light-filled, multi-level tech gallery and a rooftop terrace sheltered by a solar trellis. Forest City is curating a mix of companies in this building that are interested in a front row seat for the recruitment of talent, the opportunity to collaborate with students and faculty at Cornell Tech, and to have a space where innovation teams can work in an intense, creative, and productive environment to develop, prototype, and commercialize new products and technologies. Cornell Tech is the anchor tenant in the building. Corporate tenants include tech and investment firm Two Sigma, Citigroup, Ferrero International S.A., Tata Consultancy Services, and the robotics education nonprofit NYC FIRST. For more information about the Tata Innovation Center, visit http://tatainnovationcenter.com.